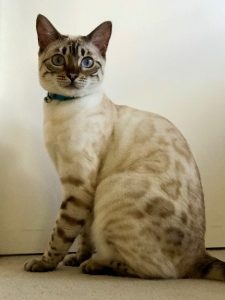 “Annapurna”, AKA ” Baby Kitty”, is a spayed 1 1/2 year old gorgeous Snow Bengal that by no fault of her own is looking for a new home. Our family has had a medical crisis that leaves us needing to rehome her and we are heart broken to have to do this as she is a wonderful kitty. Baby Kitty is very much a queen as she struts about in a regal manner and speaks her mind about whatever she wants to declare for the day. While she is a purr machine and loves to be petted she is not a lap cat as this is beneath her royal status. 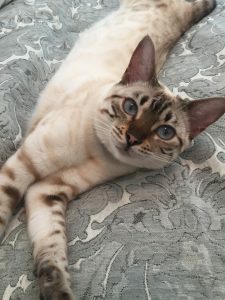 While most Bengals are very active she is on the calmer side and loves to nap with her people. She does love a good play session involving feathered toys and will leap about showing her acrobatic skills. She would do best as the only cat in the home as there can only be one queen in the castle. She is used to small canines and actually loves to play hide and pounce with them. She would be happiest in a home (not an apartment) where there is activity and people around as she is used to older children and company throughout the day. We allow her to explore the secured backyard with supervision and she loves her royal duties of chasing butterflies and sniffing flowers. She is fed a special diet of raw chicken and turkey that is best for Bengal cats that can be purchased at many pet stores. She is a love and would bring much joy. We are asking a reasonable rehoming fee that is negotiable for the right home. Please email if interested in having your own snow leopard and learning more about her: bindivc@gmail.com.